At this point the book have no content, and runs with default setting in Demo mode. In Demo mode, pageflip can only run offline. 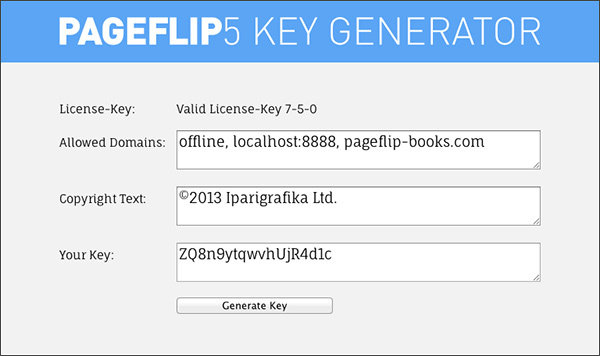 Pageflip can run now on your Domain. You can add multiple domains to the list, separated with coma. You don't have to add www. before the domain name, the script automatically removes it before domain check. You can also enable all subdomains for a domain using this formula: *.pageflip-books.com (www is not a subdomain, *.pageflip-books.com doesn't includes pageflip-books.com). Please note, that if this Option is set, the page data in the embed tag will be overwritten. The div's seen in these examples encloses the content displayed on the pages, and are not part of it. This means, on the pages, we now only see "Cover Page1", "Cover Page2" and so on. Pageflip can displayed in many ways: can have fixed size, or can be scaled, the div containig Pageflip can also have a fixed size, or can be flexible. This is why you can make full browser sized Books, or can simply embed it into a post in a website. The Book can be scaled to fit the area available, and when scaled down to fit, you can then zoom to view it at 100%. You can add margins to let some space around the Book, just for design purposes or to give space to the Controlbar and the Thumbnails. The Book size is calculated from Page and Cover sizes. Cover size is optional, needed only if you want Covers to be bigger than inside Pages. The default Page size is 300x400 pixels. If the Stage is Bigger than the Book, the Book will not centered unless you enable AutoScale (AutoScale: true), and leave UpScale disabled (default setting). All scaling, resizing options are default turned off (false). AutoScale enables book scaling with the Book centered on the Stage. The Zoom is only enabled, if the Book is displayed smaller then 100%, and zoom will enlarge it to 100%. FullScale take control of the div#pageflip, and set its size to match the Browser's Window innerWidth/innerHeight. FillScale scales the Book the way it fills the whole stage. FlexibleContent resizes the Book the way it fills the whole stage, but the Book content is rearranged instead of scaling.